Overnight Target Australia has caved in to an online petition from feminist group "Collective Shout". The group started a Change.org petition on the 29th of November and it has since soared to almost 45,000 signatures. The petition took aim at the potential for violence against women in GTA V and branded it many things such as "misogynistic", "horrific", and "sickening". The three women branded to the petition claim that "GTA 5 literally makes a game of bashing, killing and horrific violence against women". Many players of the game are upset that the petition appears to be skewed with misinformation, such as suggesting players gain "health points" for murdering women. Players of this game all around the country are also confused as to the R18+ rating that was introduced two years ago. This rating was supposed to allow unrestricted access to these games for adults over the age of 18, however since the rating has been in place games are still being refused classification (such as saints row IV) and games are still being watered down (South Park: The stick of truth). Target Australia posted a media release on the 3rd of December alongside an explanation on their facebook page. The media release states that Target Australia will continue to sell R rated movies and games that may contain offensive imagery. "We've been speaking to many customers over recent days about the game, and there is a significant level of concern about the game's content. We've also had customer feedback in support of us selling the game, and we respect their perspective on the issue. However, we feel the decision to stop selling GTA5 is in line with the majority view of our customers." A counter-petition has been launched on Change.org to protect the creative freedom of video game artists. This petition is among many others started by outraged consumers, some of which simply ask for GTA V to be sold again, others satirically demand other products such as the novel "Fifty shades of grey" to be removed alongside GTA V.
Do you think censorship has gone too far? Do you believe that these protesters have a reason to be concerned? Personally I think that GTA V is a suitable game for adults. Children that may be influenced by the game shouldn't be allowed to play it, and that is evidenced by it's 18+ rating. However parents buying the game for their children should not complain to the retailer or media after realizing what sort of content the game contains. They should take responsibility for their actions and realized that they made a bad decision. 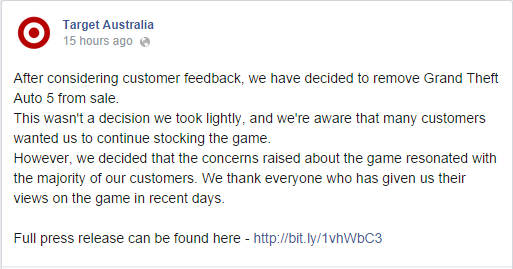 Kmart Australia has confirmed that they will also remove the game from their shelves. It should be noted that Target Australia and Kmart Australia are owned and operated by the same group, Wesfarmers.